Centenary joins with our friends and neighbors to invite you to this special event. Please join us at Stratford Academy (Henry H. Tift Fine Arts Auditorium) for a special performance of "I Never Saw Another Butterfly," commemorating Holocaust Remembrance Day. This production is Directed by Sylvia Haynie, hosted in partnership by Congregation Sha'arey Israel, Temple Beth Israel, Stratford Academy, and the Jewish Federation of Middle GA. The women’s book group is reading Where the Crawdads Sing by Delia Owens for its April 28th at meeting at Resa Taylor’s at 5:00 PM. For more information contact karolkdaniel@gmail.com. Bring a passage from your faith tradition's holy writings that currently brings you comfort, hope or inspiration. These passages will be shared around our luncheon tables. If possible, please bring a dish to share. To be respectful of all Faith traditions, please DO NOT bring foods containing pork or gelatin. We are having a Mexican Fiesta! Join us for our last monthly fellowship supper before we break for the Summer! It’s a great way to meet new friends and strengthen the bonds of community! Allison Evans from the Methodist Children’s Home will provide our program following dinner. Centenary will be teaming up with Mulberry UMC for Vacation Bible School this Year! Debra Williams & Flo Martin will be leading music. Join us for worship at 11:00 AM. Tim Bagwell will be preaching a sermon titled, “What Do You Expect?”. Painting “The Glory of Christ Easter 2008” ©Artist Stephen B. Whatley http://www.stephenbwhatley.com Reprinted with permission. 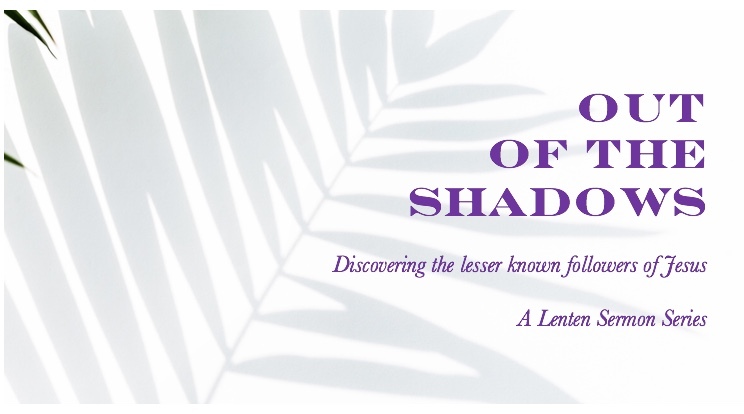 Join us for a contemplative Service of Shadows: The story of Jesus’ life in hymns, songs and scripture. The Sanctuary will be open at 6:00 PM before the service for a time of reflection at the Stations of the Cross. At Centenary, Communion is a sacred time of gathering around the table to receive The Bread of Life and The Cup of Blessing. All are invited to join in the blessed sacrament that joins heaven and earth, as we work together toward realizing The Kingdom of God on earth. Based on the Stations or Way of the Cross, you are invited into a prayerful encounter that brings to light the plight of migrants, refugees, and all those who inhabit the margins of our society. The Way of the Cross refers to a series of images depicting Jesus Christ on the day of his crucifixion. Traditionally, a series of 14 images are arranged in numbered order along a path and serve as a holy pilgrimage as one moves from station to station for intentional prayer and reflection. Each of the stations has been created by artists within the Centenary community using a variety of creative expressions. Our thanks to Bethany Buck, Dianne Buck, Barbara Wilkinson, Resa Taylor, Teri Hatley, Yvonne Stuart, Daphne Stevens, Michael Williams, and Tommy Martin for lending their creativity to this project and to Debra Williams for her leadership in envisioning and organizing it. A prayer guide will be provided to accompany your journey through the stations. Bring the family and invite your neighbors and join us for a relaxing afternoon of great food, conversation, and egg hunting for the kids. We'll gather in the Community Garden (or indoors if it's raining) immediately following the 11:00 AM worship service. No need to go home to change clothes, just come to church dressed to picnic. Fried Chicken, Pimento Cheese Sandwiches, Assorted Salads & Desserts will be provided. Be sure to mark your calendar. Rain or Shine. Spring has sprung, and the Centenary School of Creative Education is inviting everyone to join us for a bird walk in the Wesleyan Arboretum located behind Wesleyan College. Migration will be well underway, and that's a great time for birds in Georgia. Professor James Ferrari will be leading us and giving us instruction about the natural history of birds during the walk. Ferrari has been a biology professor at Wesleyan College since 1996. He received his B.A. in Biology from Middlebury College and a Ph.D. in Ecology from the University of Minnesota. He co-authored The Ecology of Fruit-Eating Birds in Georgia, 2009, with co-author Jerry Payne. Jim teaches courses in Ecology, Evolution, Field Biology, and Conservation Biology; he is also the Director of the 104-acre Wesleyan College Arboretum. He is past-president of both the Ocmulgee Audubon Society and the Georgia Ornithological Society. Meet at the parking lot next to the tennis courts and Mathews Athletic Center at Wesleyan College (past the lake). We will enter the Arboretum trails at the entrance right next to the tennis courts. To get to the tennis courts, take the entrance to campus off of Tucker Rd. At the end of the walk, we will gather at the Arboretum pavilion for some light refreshments. Whether you want to learn more about birds or simply want to enjoy a lovely morning observing them, please join us on the 13th. We encourage you to bring binoculars. If you have any questions, please email office@centenarymacon.org. All are welcome to this timely community event. We are building community in the garden. Come out and join us. The Women’s Book Group will be reading Educated by Tara Westover this month. The group will meet on March 24th at Peggy Elliott’s home. It’s time to prepare for our annual Egg Hunt on Palm Sunday, April 14th. We are re-cycling a plethora of plastic eggs and need items with which to fill them. Wrapped candy is dandy (no chocolate, please), but feel free to also get creative with child and eco-friendly non-candy stuffers. Please bring your donated items by Sunday, April 7th , so the Easter Bunny has plenty of time to stuff them. Baskets to collect items will be at the back of the sanctuary beginning Sunday, March 24th. No plastic eggs or fillers, please. Members of the WIA are invited to attend to remember and honor the victims, and to stand united in love and humanity in the face of hatred and bigotry. As Martin Luther King famously said ”Darkness cannot drive out darkness, only light can do that." Mark your calendar and join us for the next Centenary School of Creative Education event. Come learn to make your own homemade and herbal remedies for a healthy immune system. We will begin by making herbal tinctures (herbal extracts in alcohol; vinegar will be provided for those who prefer a non-alcohol version) using plants known to support the body's immune system. We will finish by making an easy, homemade hand sanitizer spray with essential oils. This class will be taught by Camille Cody. A native of Asheville NC, Camille has a background in organic agriculture and a degree in Holistic Nutrition and Herbal Medicine. She has been teaching about herbal remedies and whole food cooking since 2010 and runs a small business making and selling herbal skin care products. Join us for another educational, fun, hands-on experience. Attendees are asked to pay $5.00 to help offset the cost of supplies, and the number of attendees will be limited to 20. Please contact Yvonne Stuart to save your spot for this class: vonniestuart@gmail.com.. There will be an informational/organizational meeting for persons in Middle Georgia interested in forming a Reconciling Community in this area. Anyone interested in showing support for LGBTQIA persons are invited and encouraged to attend. For more information contact Scott Mitchell or Flo Martin. Mark your calendars for a four-week Lenten Study on Thursday evenings at 6:30 PM, March 14 – April 4. This interactive class will include opportunities for small group discussion to provide a deeper integration and exploration of the dynamics of immigration. Immigration is a complex topic. However, it has been the story of humankind throughout history. At the core of Christian belief is the profoundly radical vision of God lifting the poor, the destitute, and the homeless. Immigrants—strangers—are included in this vision of mercy and justice. As the public debate about reforming America’s immigration laws becomes more rancorous, we shall gather to thoughtfully and prayerfully consider the common myths about immigration and immigrants, the biblical injunction to welcome the stranger, and the ways in which we can continue to become a community of radical welcome. A couple of guests will share information about the current situation for our undocumented neighbors and friends. While a printed guide will be created particularly for this study, two books are recommended, but NOT REQUIRED. We will have a few copies for sale on Sunday, March 10th, and at the first class. The titles are: Christians at the Border: Immigration, the Church, and the Bible by M. Daniel Carroll; and, Welcoming the Stranger: Justice, Compassion and Truth in the Immigration Debate by Matthew Soerens and Jenny Hwang. 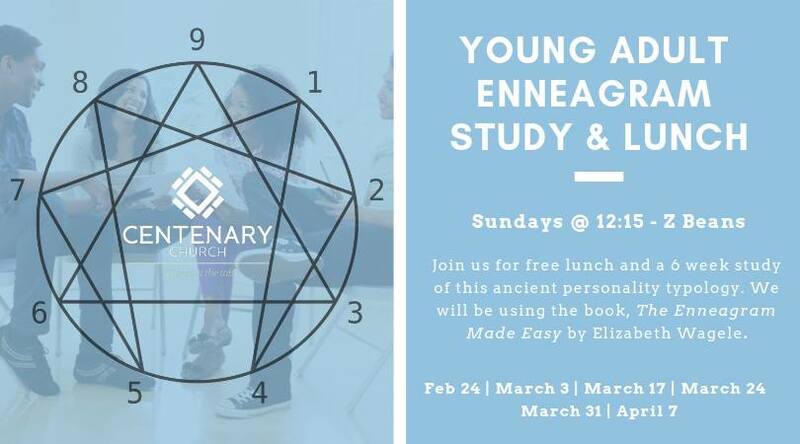 Thursdays | March 14 - April 4 | 6:30 PM | Round Room | For You Were Once Strangers: A Lenten Journey of Understanding, Faith, & Radical Welcome This interactive class will include opportunities for small group discussion to provide a deeper integration and exploration of the dynamics of immigration. 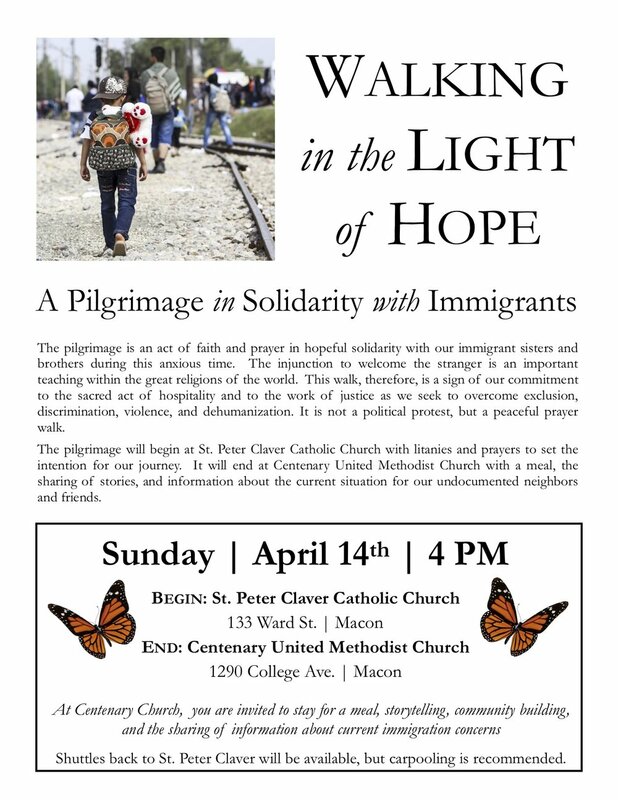 Walking in the Light of Hope: A Pilgrimage in Solidarity with Immigrants | 4:00 PM beginning at St. Peter Claver followed by dinner, community building and storytelling at Centenary. This is not a political protest, but a peaceful prayer walk. April 18th | Holy Thursday Communion Service | 7:00 PM | The Sanctuary will be open at 6:00 PM before the service for a time of reflection at the Stations of the Cross. During the season of Lent, we reflect upon the story of Jesus’s wilderness journey-his time of trial, temptation and discernment. It is a story of the universal human experience, as we consider the seductive forces of power and privilege at work in our culture and in the world. For what do we hunger and thirst? What purpose shall define our life? What is the essence of our being? What fears must we overcome to find our authentic voice and step out of the shadows? Such questions require sufficient silence, solitude and a contemplative spirit in the dessert places of our lives and shall surely humble us. Only then are we prepared to emerge “Out of the Shadows” into a world in need of the Light, which each of us has been uniquely and divinely equipped to offer. Click on the event to see the entire series schedule or listen to the sermon podcasts each week. Listen to the entire sermon series under the Worship/Sermon Podcasts menu tab. Don’t Forget to set your clock forward an hour! Ash Wednesday marks the beginning of the season of Lent, the forty days leading up to Easter. Please join us for our Ash Wednesday service in the Sanctuary following the Wonderful Wednesday fellowship supper. All are welcome to come and be a part of this brief, but meaningful service. Join us for our monthly fellowship supper! Immediately following tonight’s dinner, we will move to the sanctuary for our Ash Wednesday service marking the beginning of the season of Lent. Faith and Science - Can We Talk? If possible, please bring a dish to share. please DO NOT bring foods containing pork or gelatin. Kindly label your dish and provide serving utensils. current needs are listed on the WIA Facebook page). I am leaving Friday, February 22, for St. Louis, Missouri, where I will attend and observe a called General Conference of the United Methodist Church. The General Conference can be defined as “where the buck stops” in terms of decision making for the United Methodist Church. 862 delegates (half clergy and half laity) from all over the world will represent their own conferences for these 3 days of prayerful deliberation. This conference has been called to navigate the thorny issue of deep theological disagreement and division in the denomination. What is the issue? A 60%-65% majority of Methodists in America believe that the LGBTQ community should be welcomed openly as members, be able to pastor churches (if they are called by God), be able to serve as leaders in the church and be able to be married in Methodist Churches by Methodist clergy. In short, there should be no impediments or restrictions. All means all. Others in our denomination strongly disagree with that truth. So, what is the problem? Centenary identifies with the majority of Methodists in America. However, the United Methodist Church is global. 40% of the delegates to General Conference are from African nations, many of which have cultures that are dominantly hostile to the LGBTQ community. Death is the verdict for LGBTQ persons in many places in Africa. So, a large block of the votes from Africa coupled with a minority of votes in the United States create a General Conference majority that want our church law to tilt toward exclusion for LGBTQ persons. This impasse is a major problem. What is at stake? Our identity. Who are we? What is God’s call? For Centenary and a majority of UMC churches all over the nation, “All means all”. Traditionalists, on the other hand, believe that to be faithful to God the UMC must take strong stands against issues of inclusion and acceptance. Among leaders in the church (traditional, moderate, and progressive), it is nearly a universal opinion that the status quo in the UMC is untenable and unsustainable. Our Adult Sunday school Class meets weekly on Sunday mornings at 9:30 AM in the downstairs classroom in the Sanctuary building. 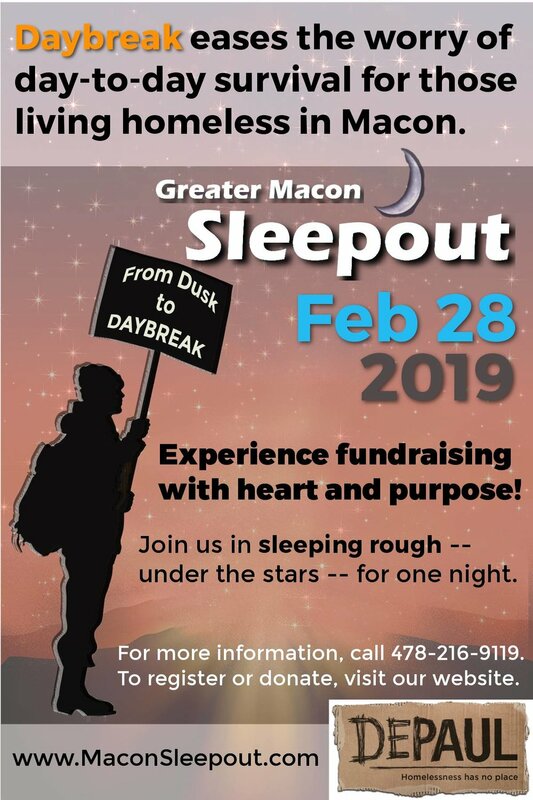 Interested in participating in this year’s Sleepout to raise awareness of homelessness and raise funds for Daybreak?